Writing in the journal Science, the international team of researchers says fishery decline is closely tied to a broader loss of marine biodiversity. But a greater use of protected areas could safeguard existing stocks. Should fish be off the menu? "What we're highlighting is there is a finite number of stocks; we have gone through one-third, and we are going to get through the rest," he told the BBC News website. Steve Palumbi, from Stanford University in California, one of the other scientists on the project, added: "Unless we fundamentally change the way we manage all the ocean species together, as working ecosystems, then this century is the last century of wild seafood." This is a vast piece of research, incorporating scientists from many institutions in Europe and the Americas, and drawing on four distinctly different kinds of data. Catch records from the open sea give a picture of declining fish stocks. In 2003, 29% of open sea fisheries were in a state of collapse, defined as a decline to less than 10% of their original yield. 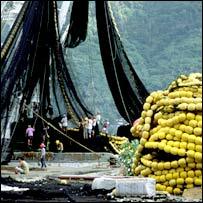 Bigger vessels, better nets, and new technology for spotting fish are not bringing the world's fleets bigger returns - in fact, the global catch fell by 13% between 1994 and 2003. Historical records from coastal zones in North America, Europe and Australia also show declining yields, in step with declining species diversity; these are yields not just of fish, but of other kinds of seafood too. Zones of biodiversity loss also tended to see more beach closures, more blooms of potentially harmful algae, and more coastal flooding. Experiments performed in small, relatively contained ecosystems show that reductions in diversity tend to bring reductions in the size and robustness of local fish stocks. This implies that loss of biodiversity is driving the declines in fish stocks seen in the large-scale studies. The final part of the jigsaw is data from areas where fishing has been banned or heavily restricted. These show that protection brings back biodiversity within the zone, and restores populations of fish just outside. "The image I use to explain why biodiversity is so important is that marine life is a bit like a house of cards," said Dr Worm. "All parts of it are integral to the structure; if you remove parts, particularly at the bottom, it's detrimental to everything on top and threatens the whole structure. "And we're learning that in the oceans, species are very strongly linked to each other - probably more so than on land." What the study does not do is attribute damage to individual activities such as over-fishing, pollution or habitat loss; instead it paints a picture of the cumulative harm done across the board. Even so, a key implication of the research is that more of the oceans should be protected. But the extent of protection is not the only issue, according to Carl Gustaf Lundin, head of the global marine programme at IUCN, the World Conservation Union. "The benefits of marine-protected areas are quite clear in a few cases; there's no doubt that protecting areas leads to a lot more fish and larger fish, and less vulnerability," he said. "But you also have to have good management of marine parks and good management of fisheries. Clearly, fishing should not wreck the ecosystem, bottom trawling being a good example of something which does wreck the ecosystem." 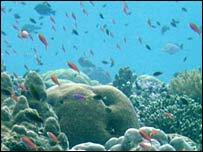 But, he said, the concept of protecting fish stocks by protecting biodiversity does make sense. "This is a good compelling case; we should protect biodiversity, and it does pay off even in simple monetary terms through fisheries yield." Protecting stocks demands the political will to act on scientific advice - something which Boris Worm finds lacking in Europe, where politicians have ignored recommendations to halt the iconic North Sea cod fishery year after year. Without a ban, scientists fear the North Sea stocks could follow the Grand Banks cod of eastern Canada into apparently terminal decline. "I'm just amazed, it's very irrational," he said. "You have scientific consensus and nothing moves. It's a sad example; and what happened in Canada should be such a warning, because now it's collapsed it's not coming back." 1. Experiments show that reducing the diversity of an ecosystem lowers the abundance of fish. 2. Historical records show extensive loss of biodiversity along coasts since 1800, with the collapse of about 40% of species. About one-third of once viable coastal fisheries are now useless. 3. Catch records from the open ocean show widespread decline of fisheries since 1950 with the rate of decline increasing. In 2003, 29% of fisheries were collapsed. Biodiverse regions' stocks fare better4. Marine reserves and no-catch zones bring an average 23% improvement in biodiversity and an increase in fish stocks around the protected area.